A 1961 Ferrari 250 GT SWB California Spider set a new Amelia Island classic car auction record when sold for $17,160,000 by Gooding. This was also the highest result ever for a car sold by Gooding at public auction an the tenth highest price ever paid for a car at public auction. Jerry Seinfeld’s 1955 Porsche 550 Spyder sold for $5,335,000 as the top result of several Porsches selling for over a million dollar. American cars also sold well a 1966 Ford GT40 selling for $3.3 million, a 1931 Duesenberg Model J for $2.6 million and and a 1964 Shelby 289 Cobra for a strong $1,320,000. Gooding held its traditional Amelia Island classic car auction on March 11, 2016, at the Omni Amelia Island Plantation in Florida, USA. Around 80 cars were on offer including 18 from Jerry Seinfeld’s collection of magnificent Porsches. Gooding earned $60 million from 79 cars offered compared to $27 million from 85 cars in 2015. The sell-through rate was an impressive 87% with an average price of $871,915 per car sold. The 18 cars offered by Jerry Seinfeld earned more than $22 million despite two Porsches failing to meet the reserve. * = Post-hammer deal. Prices include premium. As expected, the 1961 Ferrari 250 GT SWB California Spider set a new Amelia Island classic car auction record when it sold for $17,160,000. This increased the record $9,735,000 for a 1937 Bugatti Type 75 SC Sports Tourer set only the previous day at the Bonhams Amelia Island 2016 sale. It is also the most-expensive car ever sold at public auction by Gooding & Company. 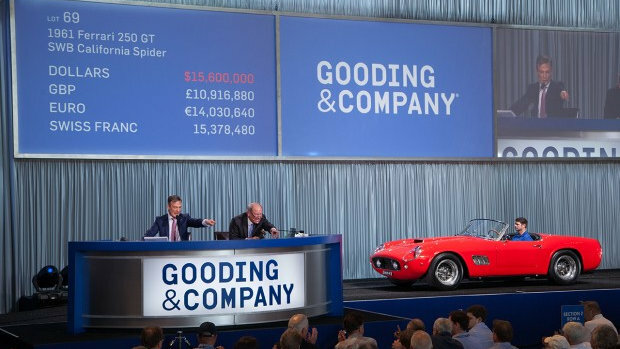 This is also the tenth highest price ever paid for a car at public auction and the second-highest price ever paid for a California Spider – only the barn-find Baillon 1961 Ferrari 250 GT SWB California achieved more when sold for $18.6 million at the Artcurial Paris 2015 sale. Six Ferrari Californias have sold at public auction for more than $10 million. This 1961 Ferrari 250 GT SWB California Spider, chassis 2871, had only three Italian owners with the vendor not having shown the car at public events since acquiring it in 1985. The car appeared briefly in Vittorio De Sica’s Academy Award®-winning feature film, Yesterday, Today, Tomorrow, when Sophia Loren hitched a lift after crashing her Rolls Royce. This 1961 Ferrari 250 GT SWB California Spider is in a largely unrestored but in contrast to the Baillon Ferrari in a well-maintained condition. Gooding traditionally has good results with Porsches at the Amelia Island classic car auctions and 2016 was no exception. A highlight of the auction was 16 Porsches offered by Jerry Seinfeld. Gooding had 18 cars from the Jerry Seinfeld collection on offer at Amelia Island 2016 including 16 Porsches. Seven of these sold in the auction for over a million with a further two not sold despite highest bids exceeding a million. Seinfeld’s 1960 VW Beetle with only 16,000 miles on the clock sold for $121,000 – more than double the estimate. The top result for cars from the Seinfeld collection was $5,335,000 for a 1955 Porsche 550 Spyder. Despite a lack of racing history, this very good result was achieved largely due to the very original condition of the Spyder. The 1973 Porsche 917/30 Can Am Spider received a disappointingly low highest bid of $2.8 million – the pre-auction estimate was $5 – 7 million. However, the Porsche was sold post-hammer for $3 million – still way below the original estimate. Although in excellent condition, the value certainly was not helped by a lack of competition history despite being painted in the Sunoco livery used by similar Penske cars. The 1959 Porsche 718 RSK in contrast to the 550 Spyder came with an impressive period racing history including the first race victory for Roger Penske, who won ten times in this car. The result of $2,860,000 was nearly a million below lower estimate. The 1974 Porsche 911 Carrera 3.0 IROC RSR sold for an impressive $2,310,000 – the pre-auction estimate was a more modest $1.2 to 1.5 million. Although this was one of only 15 RSRs specially built for Roger Penscke’s IROC series, expect more owners of lesser 911s to test the market at coming auctions. The 1990 Porsche 962C raced by Joest Racing with Porsche factory support in the 1990 FIA World Sports Prototype championship sold for $1,650,000. The 1958 Porsche 356 A 1500 GS/GT Carrera Speedster sold for $1,540,000 – around half a million below estimate. The 1963 Porsche 356 B 2000 GS/GT Carrera 2 Coupe also sell below estimate at $825,000 while a 1957 Porsche 356 A Speedster sold for above estimate at $682,000. The 2000 Porsche Carrera GT Prototype (estimate $1,500,000 – $2,250,000) received a highest bid of $1,000,000. Although this is the only surviving example of the two built, being undrivable due to Porsche removing the ECU from the engine-management system lessens its appeal. A 1968 Porsche 908 Cope attracted an unsuccessful highest bid of $2 million (estimate $3 – 3.3 million). The car finished third at 1968 Spa 1000 km race but was only raced three times by Porsche. A 1988 Porsche 959 Komfort received a highest bid of $1,100,000 – noticeably higher than the unsuccessful bids for the two other 959s that were offered for sale thus far in 2016. This car was sold post-hammer for $1,120,000. A 1970 Porsche 911 2.3 ST failed to sell at a highest bid of $900,000. This Porsche 911 was one of only seven works team cars built in 1970. It won its debut race – the Austrian Alps Rally – as well as the 1000 km de Paris. A 1995 Ferrari F50 sold for a strong $2,310,000. This low-mileage (5,500 miles from new) is one of 55 US specification F50s built. A 1960 Ferrari 250 GT Series II Cabriolet sold for $1,512,500. Of the around 200 cars built, five have been offered for sale thus far with this only the second one to have sold, partly helped by expectations being significantly lower at Amelia Island than earlier in the year at Scottsdale and Paris. A 1963 Ferrari 250 GT Lusso Coupe sold for $1,875,000 in a post-hammer deal. The highest regular bid was $1,750,000. The 1966 Ford GT40 Mk1 sold for $3,300,000. It is one of only 31 originally produced and has covered only 3,200 miles since new. The 1931 Duesenberg Model J Disappearing-Top Convertible Coupe is similarly a fairly low mileage car with just over 30,000 miles on the clock. It achieved $2,640,000. The 1964 Shelby 289 Cobra sold for a very strong $1,320,000 – $200,00 over the upper pre-auction estimate. The value as helped by an extensive SCCA race history, a Le Mans hardtop, a spare engine and a top restored condition.